Here I've gone for my light skinnie jeans from H&M (they already had rips in them, but I wanted more and got a little carried away... it's easily done! 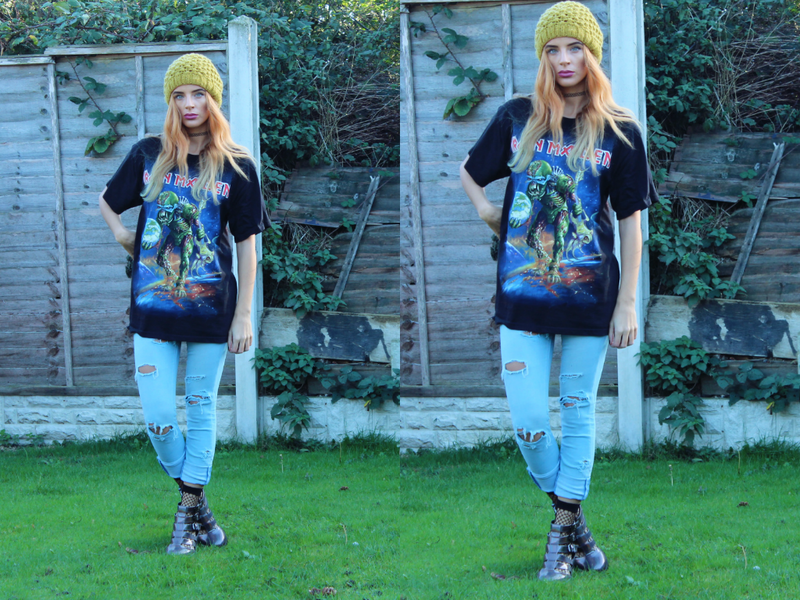 ), I'm also wearing one of my dads old Iron Maiden tour t-shirts and of course my cute little beanie hat from H&M. I love the colour of this one, although my brother in law said that it looks like something you'd stick on top of a tea pot! It's so nice to throw on a baggy tee, jeans and a beanie especially when you want to cover up that crazy unwashed hair from time to time. Can you tell this is an older post with the hair? Yuck! I've had this post sitting in my drafts for ages as I'm not too keen on the photos, but ahh well it's been far too long since I've shared an outfit post with you guys. What is your favourite thing to throw on when you're having a lazy day? You look super stylish ! Love the top ! Love a good graffic tee! Looks great! I love your tshirt!